Angel Di Maria: Why did record signing not work for Man Utd? He was British football's most expensive signing, a World Cup finalist and regarded as one of the best players in the world at the peak of his powers. His capture was supposed to be a show of power from Manchester United that they could still compete with Europe's elite for the best players. 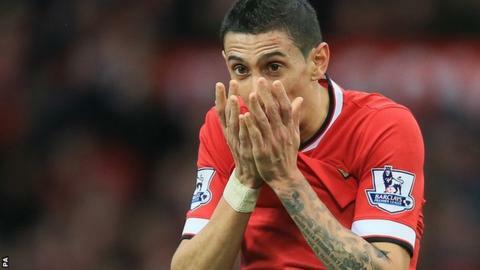 But as Angel Di Maria looks set to leave Old Trafford for French champions Paris St-Germain after a single year in the Premier League, BBC Sport looks at why the £59.7m Argentina international has failed on the stage which seemed ready-made for his talents. It all seemed so perfect. In the summer of 2013 Manchester United had been looking for a marquee signing with which to usher in the post-Sir Alex Ferguson era. Cristiano Ronaldo could not be lured back from Real Madrid. Gareth Bale was chased but his heart was set on joining Ronaldo at the Bernabeu. Twelve months on, the need was more acute. Without the collective mental strength Ferguson so painstakingly forged, technical and physical deficiencies had been exposed during David Moyes' ill-fated tenure. Glamour was not required purely to make United fans feel good. It was a necessity if they were to compete with Chelsea, Manchester City and Liverpool, who had taken their Champions League place. Real, back in the 'Galactico' business of accumulating star names, had one man too many following the arrival of one of the 2014 World Cup's stand-out performers, Colombia's James Rodriguez. Di Maria, man of the match in the Champions League final three months earlier, was deemed surplus to requirements and United executive vice-chairman Ed Woodward swooped. The Argentine signed a five-year contract on 26 August, 2014, for a British record fee of £59.7m. Talk at the time suggested Di Maria would be paid in excess of £200,000 a week, with bonuses for winning the Premier League, Champions League and even the Ballon d'Or for the world's best player over the course of a five-year contract. His early performances suggested such optimism was justified. Di Maria scored a goal and claimed an assist in three of his first four games for United. The stand-out effort was a magical chip at Leicester on 21 September to put the visitors two goals up in a game they were eventually to lose 5-3. United fans were in thrall to their new number seven. Di Maria responded by saying moving to Old Trafford from Madrid represented a step up in his career. Did an attempted break-in at his home unsettle Di Maria? Working out why good things turn bad is a precarious business. The facts are that after the victory over Everton on 5 October, Di Maria did not score another goal until 4 January, when United beat League One Yeovil in the FA Cup third round. Did anything happen in between? Maybe not one seismic moment but a few events rolled up and made a big one seem all the more significant. In October, Argentina lost a friendly match 2-0 against Brazil in Beijing. Di Maria played the full 90 minutes. The air quality was not great, the temperature was high. Three days later, Di Maria featured for the final 17 minutes of a friendly against the Hong Kong national side. The round trip was approximately 12,000 miles. For a player who had not had much of a summer break because of his international commitments and had finished the World Cup with a thigh injury, the Far East trip must have been physically draining. In addition, United manager Louis van Gaal's search for his best formation - and Di Maria's best position in it - meant there was little consistency to his role. In the South American's first 16 United games, he played in six different positions, including central midfield and striker. As consistency continued to prove elusive, Di Maria's contribution seemed to be affected. As well as not scoring, he created only three goals in four months between 6 October, 2014 and 10 February, 2015. A pelvic injury kept him out for virtually all of December. So a combination of likely fatigue, injury, lack of form and getting used to a new country and obvious language difficulties could all have been playing on his mind on 31 January, when thieves attempted to break into Di Maria's mansion in Cheshire. Although the intruders did not gain entry, they did smash a glass door and the mental impact on Di Maria's wife, Jorgelina Cardoso, and their young daughter, was so great they are now living in a city-centre apartment, which, while luxurious, is hardly ideal for family life. On the pitch, Di Maria's slide continued. Sent off in the FA Cup quarter-final defeat by Arsenal on 9 March, Di Maria was a substitute in six successive games following his return from suspension. He did start the final match of the campaign against Hull, only to limp off with a hamstring injury after 23 minutes. This combination of circumstances led to Di Maria becoming extremely unhappy and wanting a move. As recently as Sunday, Van Gaal said he hoped the Argentine would stay. Yet the Dutchman has also stated at various times over the past year it is counterproductive trying to keep unhappy players. The difference between this situation and goalkeeper David De Gea's possible move to Real Madrid, for instance, is that while the Spaniard is a relaxed presence around the United camp, Di Maria has not joined up with the squad in the United States on their pre-season tour while his future is thrashed out. Paris St-Germain were keen on taking him last year and are now offering a get-out. For United, the bitterness of losing a player of such talent is eased by a transfer system which means, financially, they may not take the massive hit it first appears. Because of the strength of the pound and the change in exchange rates in the past 12 months, plus the way the initial transfer fee was structured, if PSG agree to pay the reported 65m euros (£46.05m), United's overall loss would be less than £10m. United fans have been here before. Juan Sebastian Veron arrived with enormous fanfare - and a then British record £28.1m price tag - from Lazio in 2001 but lasted only two seasons before he left for Chelsea. Sir Alex Ferguson also broke the club transfer record when he paid Tottenham £30.75m for Dimitar Berbatov in 2008. The Bulgarian did win the Golden Boot in 2010-11, but finished the campaign not able to get a place in United's Champions League final squad. Within six months he had left for Fulham. Yet possibly more than those two, Di Maria's eventual exit will leave a sad sense of 'what might have been' purely because his talent has been so obvious in the past and his departure so swift. "I don't understand it," said Ryan Chelva, a fan from Australia who saw United beat Barcelona 3-1 in Santa Clara, California, without Di Maria at the weekend. "If you sign someone as good as him, you have to give him more than a single season. "He played really well in his first couple of months. He proved he can play under Louis van Gaal. He proved he has the talent. Now it looks as though he is leaving. It is hugely disappointing."